Choosing a locally owned store generates almost four times as much economic benefit for the surrounding region as shopping at a chain, a new study has concluded. The analysis also found that eating at a local restaurant produces more than twice the local economic impact of dining at a chain restaurant. 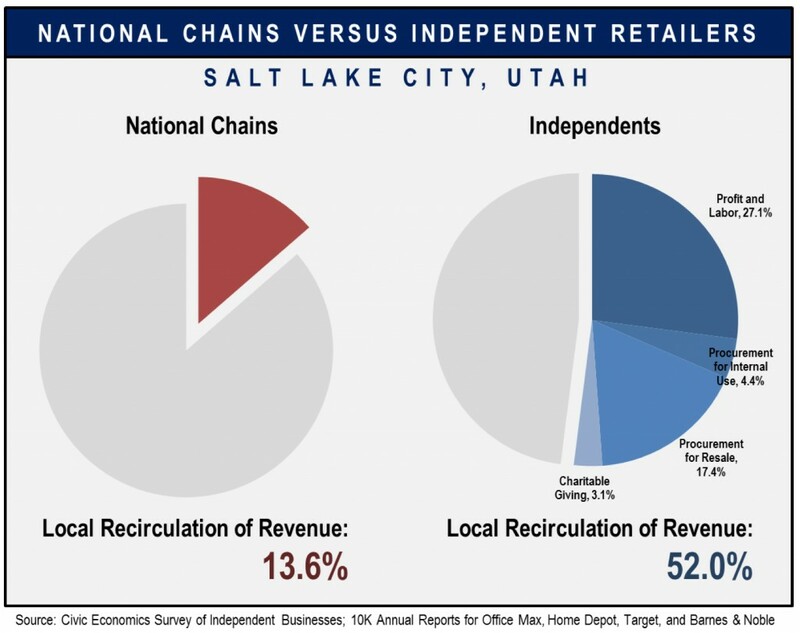 The research firm Civic Economics analyzed data from fifteen independent retailers and seven independent restaurants, all located in Salt Lake City, and compared their impact on the local economy with four chain retail stores (Barnes & Noble, Home Depot, Office Max, and Target) and three national restaurant chains (Darden, McDonald’s, and P.F. Chang’s). The study found that the local retailers return an average of 52 percent of their revenue to the local economy, compared with just 14 percent for the chain retailers. Similarly, the local restaurants re-circulate an average of 79 percent of their revenue locally, compared to 30 percent for the chain eateries. What accounts for the difference? In a handy graphic, Civic Economics shows the breakdown. 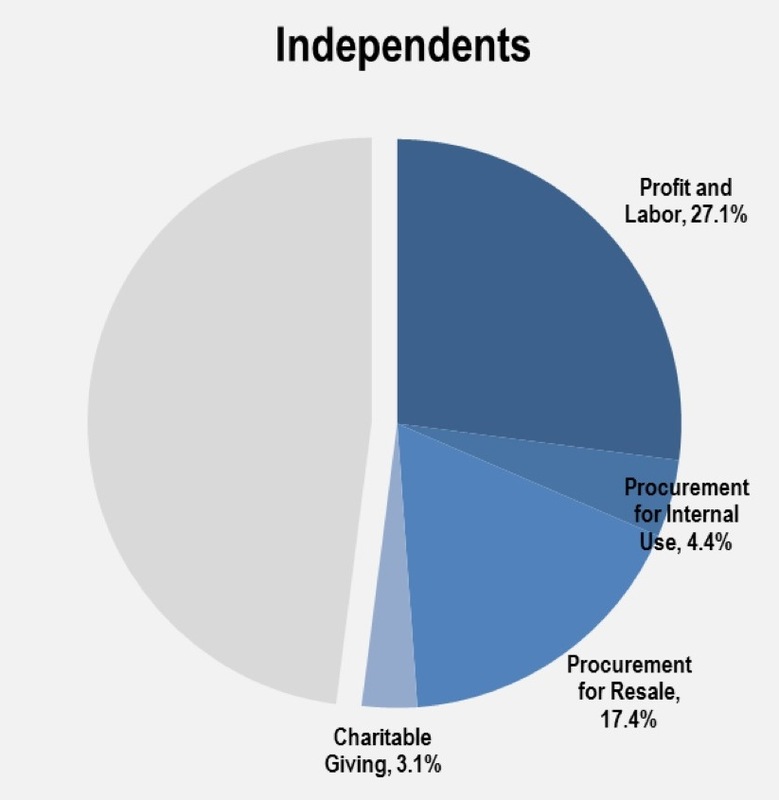 Independent businesses spend much more on local labor. They also procure more goods for resale locally and rely much more heavily on local providers for services like accounting and printing. This means that much of the money a customer spends at a local store or restaurant is re-spent within the local economy, supporting other businesses and jobs. Chains have little need for local goods and services, and keep local labor costs to a minimum. Most of the revenue that these stores and restaurants capture leaves the community. The study is part of a nationwide research project being conducted by Civic Economics in partnership with the American Booksellers Association. Other communities where a similar data analysis is underway include Bainbridge Island, Washington; Chicago, Illinois; Las Vegas, New Mexico; Louisville, Kentucky; Milwaukee, Wisconsin; Pleasanton, California; and Raleigh, North Carolina. Also, on top of the business expenses broken down above, wouldn’t presumably the profit stay local for an independent, with an additional portion of that then recirculated through local spending (or even investment) by the owners? Thank You, Stacey. You help me stay focused! Remember to spend your Dine and Drink dollars locally too! The chains want all your entertainment business. What has happened to the movie houses will happen to the restaurants, taverns and venues for parties if you spend all your dollars at the Mall restaurants. Small taverns and local restaurants support whole neighborhoods and their sport clubs and charitable gatherings and reunions of all kinds. Go face to face with your neighborhood! Build some Social Capital over darts ! Stacy, great piece. There is a lot of evidence that shows buying from local independent businesses is better for the economy. Question – do you have any data on how many independent businesses there are in the USA? Not small businesses – but businesses that are considered truly to be a “local merchant”? Here are some links that might be useful. The short answer is that the only real count is the one done by the economic census. It’s done every 5 years, but it takes forever for them to release the data. So the most recent data we have is from 2007. That data was published in 2010, so expect the next round (2012) to come out in 2015. But looking by number of employees is not a bad way to go as a proxy for independent. The data there is more recent, 2009, with 2010 data probably out soon. Anyway, see the links.